Versace Eros (a scent for a “hero” says Donatella Versace) launched this winter; the Eros ads are hilarious (the film is over-the-top kitschy and the print ad (see below) is, I assume, “inadvertently” funny, with the model’s body reconfigured by Photoshop so a huge bottle of Eros could be inserted where his abdomen-crotch-upper thigh should be…leaving a ludicrously elongated body). Ads aside, I was not expecting much from Eros, the perfume. Eros begins with vanilla-mint aromas, reminiscent of barbershop fragrances (Jean Paul Gaultier Le Mâle, anyone? ); ambroxan with a clove-like touch appears next alongside hard-working, always-employed tonka bean. Eros’ base notes of cedar (discernible) and vetiver-oak moss are well blended to produce a standard-issue woody accord. Eros starts off as a warm fragrance, not cool or crisp or “fresh” in the sense we’re used to in men’s mainstream/designer perfumes. As I wore Eros I thought: “Not great, but not awful. So-so.” But I only had to wait about 15 minutes for Eros’ true character to emerge…and this guy’s not a “hero” but a phony (and cheap to boot). As it stays on skin, Eros’ vanilla curdles, its ambroxan sours and explodes on skin (go away!) and an Axe-like “clean/fresh” note emerges that, when combined with the oriental-woody elements, makes me queasy. I’m sure there’s not one natural ingredient in this perfume…or even any expensive man-made materials. I often wonder what perfume will smell like if the EU/IFRA continues to get its way and deletes all materials from fragrances that cause even a few people on Earth to have an allergic reaction. If hyper-artificial Eros is an example of the fragrances we should expect from such rules, regulations and restrictions, I’ll stop buying perfume and spend my money on flowers at the florist and in my garden. Versace Eros, currently a Macy’s exclusive in the US, is available in 30, 50 ($62) and 100 ml ($80) Eau de Toilette and in matching grooming products (shower gel, deodorant, aftershave balm). First of all I wanted to say that the bottle looks cheap and uninteresting to me. Your description makes me want to avoid this thing even more. Eros still hasn’t arrived to Poland yet but I will probably leave it without a sniff. I remained rather cold for it, cold as the cold blue bottle. Lucasai, good morning! The bottle is better than the fragrance…which is not saying much. Oh, dear. It sounds like if the EU/IFRA continue to ban ingredients, we will all have to go back to the middle ages and start making our own scented waters. Perfumebottles…time for natural perfume making class. Rick, we’ve all made that mistake!!! Also, the next big IFRA ruling is this year…. That’s why I have a refrigerator full of vintage bottles! And I never “stockpiled” so much as a drop of water for Y2K! lol! Rappleyea: I have a lifetime supply of perfume but not an earthquake kit in the house…or car. If Eros is anything like Versace Pour Homme or Versace Versace Man Eau Fraiche, then I am willing to give it a try; I really like the other two mentioned but think that Pour Homme could have been done a little better and richer. I do expect more from a designer that is well established as Versace. I will Try a small bottle first before committing to a larger size. I’ll stick to my garden too… although my Starburst lilies do cause me to sneeze and my prized foxgloves are poisonous. IFRA will probably want to prevent me from growing then! You know about the IFRA penitentiary, right? Platinum: one hopes sanity will prevail…or just have everyone move their companies to the US. Europe? REVOLUTION! Wow, I LOVED the videos and was secretly hoping this would be the next Egoïste. That print ad is just strange. I think he’s wearing a robe because it’s impossible to put pants on when your hands don’t reach your hips! I have to disagree with those who find bottle cheap looking. To me it’s a masterpiece and one of the most thoughtful perfume bottles in years. Really eye catching bottle. To say about the fragrance. Versace Eros could easily be named the fragrance of nowadays that replaces Pace Rabanne One Million in this rank. It starts off with powerful mint note (the scent is minty on a whole) combined with sweet fruits. Soon a modern synthetic molecule of masculinity (à la in Paco Rabanne Black XS and Diesel Only the Brave) begins to play and the scent now smells like a typical synthetic fruity woody. It reminds of a minty version of James Bond perfume that was also created in Givaudan but costs cheaper. Nevertheless Eros has wonderful longevity and sillage and girls like it! Same here..(3 years later). Creative bottle…1 Millionish/ Pour homme/Lacoste/ADGio fresh..yet vanillish/minty& oakmossy tough! Longevity is a plus too. That print ad, LOL. And that weird face on the bottle is just creepy, imo. And I don’t want a green apple note on my man, or me..just sayin:). Omega: thankfully I didn’t detect apple…thank the gods for small miracles. “Always-employed tonka bean.” Very funny. It’s the Morgan Freeman of fragrance notes. You think it’s just yours only to find it’s got 50 releases due out this year. Chrisskins: tonka is everywhere…it used to be one of my favorite aromas, now I’m just sick of it. I kind of like that bottle; it looks like its made of mint toothpaste gel! I was hoping this would be good because I really found the advert fantastic – I replayed it about 6 times to see his funky gold gladiator sandals; the overplayed poses etc! Not to mention the husky voiced ‘Eros the new Versace fragrance for men’. By the way, I heard something about tonka bean being on the endangered list – is that true, or even possible? Merlin: I can’t believe it’s true…but hey, why not? (if by endangered, you mean by IFRA). It does cause problems when ingested…though you’d never know it here in Seattle where pastry chefs use it in creams, custards, etc. I quite liked the bottle when I had in front of me, the frag was fine, no thing new just another one on the bandwagon of le male/one million. But I didn´t try on my skin so now I wonder if I should bother next time. 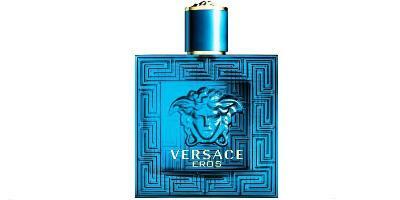 From Versace I like that weirdo that is Dreamer and could see myself wearing Eau Fraiche in a hot weather. Racine / Antonpan: I don’t mind the bottle either…Very Versace, isn’t it? Too bad they wouldn’t put some good juice in it. Anybody see the Versace fold out ad in the March Vanity Fair? It’s a continuation of the sparkly blue gladiator long in the crotch and short in the forehead theme. I laughed my guts out. Very kitchelicious. How disappointing to read that it’s another letdown from Versace. Was really hoping this might be a redeeming fragrance. I bought the LARGE bottle and am not disappointed; I actually like it. Versace Eros reminds me of any Eighties fragrance which I loved; I love heavy fragrances and the Eighties were the epitome of heavy colognes. Eros reminds me of an “updated” version of Versace Versus for men. As much as I respect Kevin’s reviews and views on new colognes, I always seem to have the opposite opinion on the same ones, therefore, once again, I DO REALLY LIKE VERSACE EROS and am glad I added it to my fragrance wardrobe.